In this four-part series, we’re sharing our favorite recipes that take the unmistakable flavor of celebration from the flute to the plate. Last month, we shared a recipe for an appetizer that’s substantial enough to be presented as an entrée, Bouquet Prawn Skewer with Olive Oil, Champagne, Basil, Rosemary & Dill. This month, a simply elegant salad with a light Champagne vinaigrette. Because of Champagne’s complexity in fruit, tartness, and mouth-feel, it’s a great substitute for vinegar. In this recipe, we’re using Champagne because we need tartness, fruitiness, and a bit of sugar. Champagne possesses all three. Equally important, its bubbles provide an effervescence that enlivens the taste buds and balances out the earthy mushroom flavor. Next time you make a dessert, stock, sauce, or dressing, consider giving your dish a bit of bubbly. Strudel conjures up images of flaky, Old-World desserts for most Americans, but in Europe, we also fill the thin pastry crust with an array of savory offerings. You may freeze this strudel, unsliced, and simply reheat it for a delicious addition to an impromptu dinner party. If you don’t have time to make the strudel dough, substitute packaged puff pastry. In season, we use wild mushrooms foraged from the Wisconsin countryside, but a blend of store-bought portabella, crimini, shiitake, button, and chanterelle mushrooms will work nicely. This salad may be served cool or warm. In a sauté pan, melt a tablespoon of the butter with the olive oil. Add the shallots and garlic and sauté until softened, about 1 minute. Add the mushrooms and sweat, about 2 minutes. Add the spinach, parsley, chervil, and tarragon. Add the wine and reduce until almost dry. Remove from heat and allow to cool. Pour the flour into a food mixer fitted with a paddle attachment. Add the salt, water, and oil and process until combined. Switch to a dough hook attachment and process on medium speed until the dough becomes elastic, about 10 minutes. Form the dough into a ball and brush with a bit of the butter. Wrap the dough with plastic wrap and allow to rest at room temperature for 2 hours. Turn the dough out onto a large kitchen towel sprinkled with flour. Roll it out until it is as thin as possible; you should be able to see through it. Place the dough on a baking sheet lined with Silpat or parchment paper. Pour the mushroom filling vertically down the right-hand side of the dough, leaving the edges clean. Brush the edges with eggwash. Lift up on the long edge of the dough and pull it up toward you until the dough begins folding over itself. Roll completely and brush with the remaining butter. Sprinkle with the Gruyère and bake until golden brown, about 30 minutes. Whisk the vinegar, Champagne or sparkling wine, mustard, sugar, salt, and pepper together in a mixing bowl. Continuing whisking, adding the olive oil in a slow, steady stream. Toss the greens with the vinaigrette, making certain that each leaf is completely coated. Place the greens in the center of each serving plate. 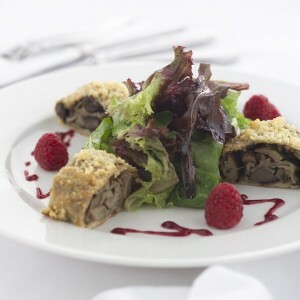 Slice the strudel into 1 ½-inch slices and place 3 slices atop each salad. Drizzle raspberry coulis around the salad and garnish with a few fresh raspberries. Raspberry coulis is a simple raspberry sauce that brightens up savory dishes, cuts the richness of chocolate desserts, and adds eye-dazzling color to any plate. Placed in a fine-nozzled squeeze bottle, it can be stored in the refrigerator for up to 2 days. Place the raspberries and 2 tablespoons of the sugar in a food processor or blender and purée. Add more sugar, if necessary. Pass the puréed berries through a fine mesh sieve to remove the seeds. It may be necessary to add a little water to thin the coulis. © Marcel Biró and Shannon Kring Biró. Adapted for Sally’s Place from Biró: European-Inspired Cuisine cookbook (Gibbs Smith 2005). All rights reserved.